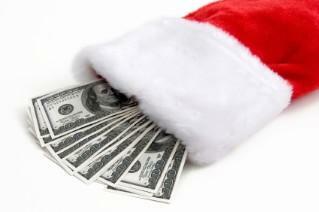 Increase cash flow with holiday fundraisers. Coming up with Christmas fundraising ideas may seem like a daunting task. After all, not too many people have extra money during the holidays to donate to even the worthiest cause. But you may be surprised at how infusing a few tried-and-true fundraising ideas with some holiday spirit can really make your fundraiser a success. As with any fundraiser, the group should brainstorm ideas before making the final decision. Choosing the type of fundraiser well before Christmas, even before Thanksgiving, can give members a chance to get organized before the busy holiday season arrives. Large groups may benefit from having a committee (either voluntary or elected) come up with ideas and narrowing them down to a few contenders. Once the committee has narrowed the choices, they can present the options to the large group for a vote. Smaller organizations may simply have an idea brainstorming session, where pros and cons are debated until a final selection is made. By allowing members to have a choice in the type of fundraiser, the group will have a better chance of people participating in the activity with true holiday spirit. Organizations that have trouble coming up with a holiday fundraiser on their own may want to take some tried-and-true ideas and put a little Christmas spin on them. By simply tweaking a few things, a number of successful fundraisers can be done during the holiday season. Raffles have long been a popular fundraiser. Securing a large, desirable donation is often the hardest part. Consider getting cleaning service gift certificates, electronics items, or even bigger items like vehicles or trips. Be sure to give a receipt to donors for tax purposes. If you cannot get a desirable item donated, consider utilizing talents within your group, such as having a large holiday quilt handmade or offering snow removal services. Sell raffle tickets early in the season, as people may be more apt to purchase several in the hopes of winning a large prize to give as a gift. Place your members up on auction for a certain number of hours’ worth of work, however the buyer should choose. Or, if members have special talents like baking, auction them off for specific tasks, such as preparing freeze and bake Christmas dinners. Food related fundraisers rarely flop. After all, everyone needs to eat. Host a breakfast (with presold tickets and tickets at the door) at a community hall. Advertise it as “Breakfast with Santa” and take snapshots of kids with someone dressed in a Santa costume. Similarly, you could host a “Soup and Santa Supper” where you offer up homemade chili, chicken, and vegetable soups while Santa makes the rounds.Holiday bake sales are a big hit as well. Have group members make a number of delicious desserts. Divide them into categories such as decorated cakes, chocolate goodies, candies, and mints. Bake sale success often depends on location, so get permission to host your sale at a local retailer, high school sporting event, or church choir concert. Consider setting up a concession stand with hot chocolate, coffee, and snacks to increase your fundraising success. Choose a fundraiser that employs member talents. Organize early and divide into committees if necessary. Stay away from fundraisers that other groups are doing. If three other groups are hosting bake sales, pick another benefit. Word-of-mouth is great, but a few flyers or even an advertisement can make all the difference. Remember that no matter what your Christmas fundraising ideas may be, if you plan ahead and keep the holiday spirit, it should be a success.